The Precision Health Initiative is the first of Indiana University’s Grand Challenges. The Initiative is a highly personalized approach to prevention and treatment of diseases - prevalent in Indiana - that takes into account individual variables in genes, environment and lifestyle. Success of the Initiative will be measured by the impact it has on the lives of people living in Indiana. Roughly two in five Indiana residents develop cancer. Therefore, the Precision Health Initiative has aggressive plans to develop a cure for at least one cancer. The cancers targeted for cures are either multiple myeloma, triple negative breast cancer, or both. In addition, the Precision Health Initiative plans to cure at least one childhood cancer, and has pediatric sarcoma in its sights. The Initiative also has bold prevention goals and wants to stop Alzheimer’s disease and prevent type 2 diabetes that results from gestational diabetes. 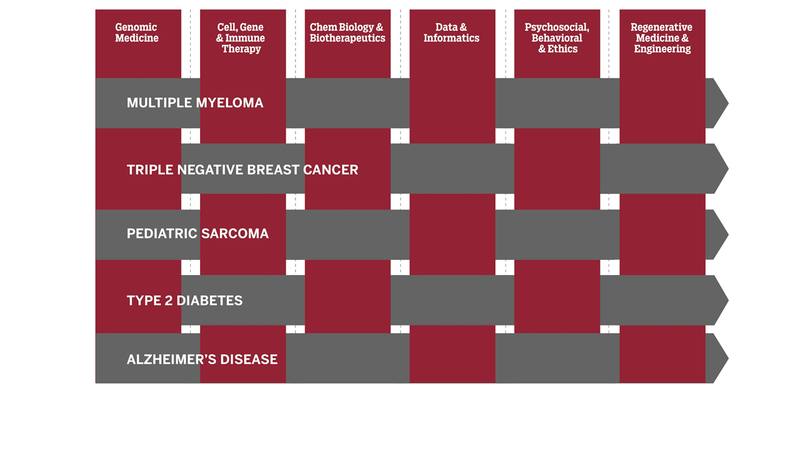 To better treat, cure or prevent these diseases the IU Precision Health Initiative has created six scientific pillars 1) genomic medicine; 2) cell, gene and immunotherapies; 3) chemical biology and biotherapeutics; 4) data and informatics; 5) psychosocial, behavioral and ethics; and 6) regenerative medicine & engineering. Identified diseases are taken through each pillar using a team science approach until the disease is treated, cured or prevented. In the case of triple negative breast cancer, a person with the disease has their tumor genetically sequenced (using one of five precision genomics clinics) to extract their DNA. Then, the DNA is analyzed for the existence of a current treatment by way of the cell, gene and immunotherapy pillar. If one is not identified, the genetic information is taken to the chemical and structural biology pillar for further analysis and potential development of a new treatment using new research, capabilities and technologies. The data is stored for use in additional patients and the patient’s environment is studied – along with their individual behavior – in order to target their treatment even more precisely than before. The whole process is repeated until the treatment of disease is revolutionized through IU's Precision Health Initiative and Indiana's residents have become healthier. All knowledge from the initiative is being integrated into research training and clinical education to further propel IU’s reputation as one of the leading universities with one of the nation’s top medical schools.